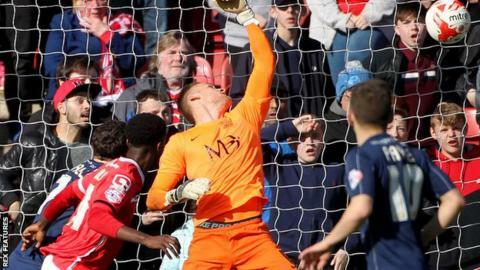 Jordy Hiwula kept Walsall's League One automatic promotion hopes alive as his late winner downed mid-table Southend. The on-loan striker headed an 88th-minute corner against the underside of the bar and, although it was cleared, the assistant referee awarded a goal. The Saddlers are now within three points of the automatic promotion places after second-placed Burton Albion were held to a 0-0 draw by Barnsley. With a game in hand and a slightly better goal difference over Burton, automatic promotion from League One is now back in the Saddlers' own hands. "If I thought about how it's been over the past six weeks, I would be worn out. But I've got an energy about me. The players enthuse me. "I always talk about this energy balance and we have to give it back. The players have to be energised and they are doing that. "I'm just really pleased about the way we won and the way that we ground it out." Match ends, Walsall 1, Southend United 0. Second Half ends, Walsall 1, Southend United 0. Foul by Adam Barrett (Southend United). Corner, Southend United. Conceded by Neil Etheridge. Attempt saved. Adam Barrett (Southend United) right footed shot from outside the box is saved in the top centre of the goal. Foul by Romaine Sawyers (Walsall). Sam McQueen (Southend United) wins a free kick in the defensive half. Jason Demetriou (Walsall) wins a free kick in the defensive half. Foul by Sam McQueen (Southend United). Attempt saved. Kieron Morris (Walsall) right footed shot from the centre of the box is saved in the bottom right corner. Goal! Walsall 1, Southend United 0. Jordy Hiwula-Mayifuila (Walsall) header from the centre of the box to the bottom right corner. Assisted by Kieron Morris with a cross following a corner. Corner, Walsall. Conceded by Adam Barrett. Corner, Walsall. Conceded by Daniel Bentley. Attempt saved. Kieron Morris (Walsall) left footed shot from outside the box is saved in the top left corner. Paul Downing (Walsall) wins a free kick in the defensive half. Foul by Jamar Loza (Southend United). Kieron Morris (Walsall) is shown the yellow card for a bad foul. Foul by Kieron Morris (Walsall). Substitution, Southend United. Jamar Loza replaces Tyrone Barnett. Attempt missed. Matthew Pennington (Walsall) right footed shot from the centre of the box is close, but misses to the right following a corner. Corner, Walsall. Conceded by David Worrall. Foul by Adam Thompson (Southend United). Attempt blocked. Jason Demetriou (Walsall) right footed shot from outside the box is blocked. Substitution, Walsall. Jordan Cook replaces Sam Mantom. Gary Deegan (Southend United) is shown the yellow card for a bad foul. Attempt saved. Sam McQueen (Southend United) left footed shot from outside the box is saved in the bottom left corner. Substitution, Southend United. Kevan Hurst replaces Will Atkinson. Hand ball by Anthony Forde (Walsall). Adam Chambers (Walsall) is shown the yellow card for a bad foul. David Worrall (Southend United) wins a free kick in the attacking half. Substitution, Walsall. Kieron Morris replaces Milan Lalkovic. Gary Deegan (Southend United) wins a free kick in the defensive half.